As if preparing for Thanksgiving weren’t stressful enough, I know some of you are hatching elaborate shopping plans for Black Friday – a few with the intention of getting all your Christmas gifts purchased in one day. The mere thought of joining the hordes on Friday morning gives me anxiety-induced chest pain, so I will limit my participation to Cyber Monday, which is sure to include a large cart full of books at Amazon.com. I admittedly went a little overboard last year. 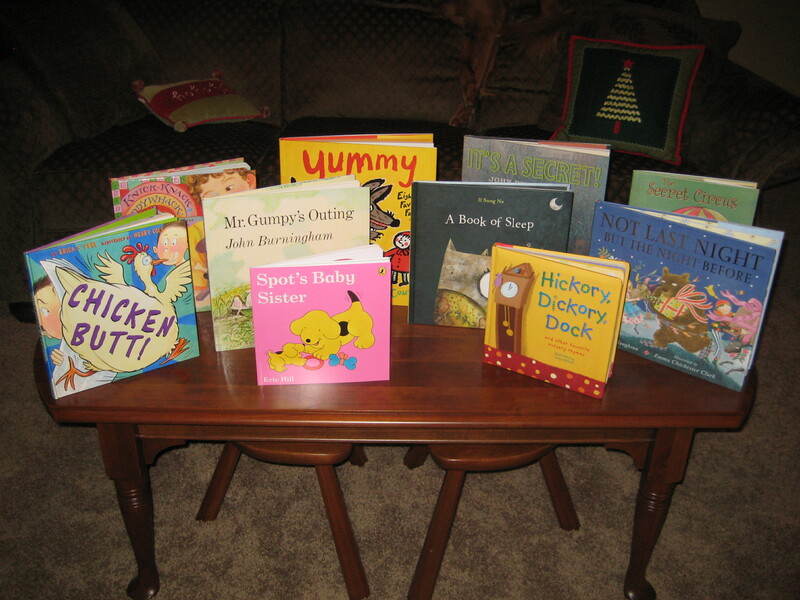 A table full of books greeting Eloise and Charlotte on Christmas morning 2009. 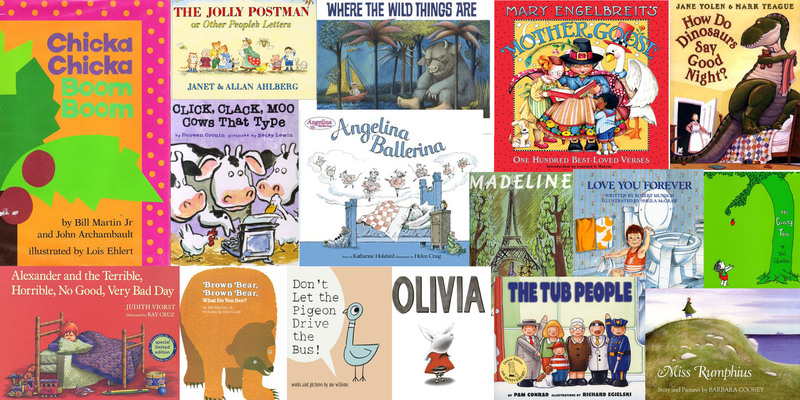 For those of you shopping for children, I put together my lists of Best Board Books for Babies and Best Picture Books for Toddlers. The lists were inspired by a request from a high school friend who recently welcomed her first child and is building the foundations of her baby’s library. She wanted my recommendations for classics old and new. The titles on my list are selected from our home library and include books that have universal appeal. They are either books I loved as a child or ones to which my daughters’ have been especially attracted. As requested, these are what I consider to be some of the best building blocks for a home library. As a result, the picture book list in particular does not include many of the quirkier finds I’ve written about in the past and will write about much more in the future. Having compiled these lists, I’ll be the first to admit how imperfect they are. The selections were based solely on my own reactions as a child and the experiences I’ve had with my children (whose tastes may vary significantly from other children’s). But the process of developing the lists did make me incredibly curious about what the rest of you think are the most essential children’s library classics. I’d love to hear what additions you’d make! “Moo Baa La La La” by Sandra Boynton. Also try “Barnyard Dance” and the rest of the Boynton collection. 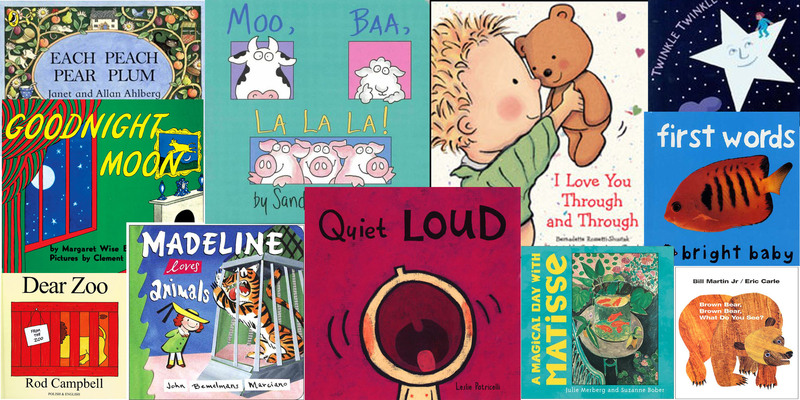 Leslie Patricelli’s Books: “Big Little,” “Quiet Loud,” “No No Yes Yes,” “Yummy Yucky” and others. Mini Masters Collection by Julie Merberg and Suzanna Bober: Stories, told in rhyming text, are based on the art of Van Gogh, Monet, Picasso, Matisse, Renoir, Cassatt, Seurat, Degas, Gauguin and Rousseau. The Eric Carle Collection: “Brown Bear, Brown Bear, What Do You See?” and “The Very Hungry Caterpillar,” in particular. I’m sure there are more… but those jump to mind! Thank you Thank you Amanda! This is just what I was looking for. I’m so tempted to go buy these all at once but my husband probably wouldn’t approve :). I will get several for Georgia’s Christmas gifts and now I have an awesome list to work from as I stock her shelves throughout the year. Thanks again and I’m excited to see what suggestions and reviews you have lined up for 2011!